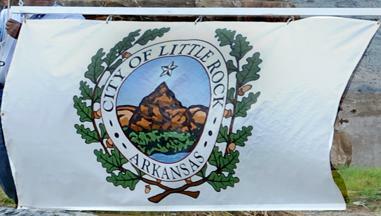 The flag of Little Rock has a white field, with a horizontal royal blue stripe and a vertical forest green stripe, both fimbriated in golden yellow, converging as in a Scandinavian cross upon a modified representation of the city seal in golden yellow. Each stripe is in turn fimbriated again in its own color. The image on the seal is a mound or rock pile against a level background. Suspended above the mound is a red silhouette of Arkansas with a golden yellow five-pointed star marking the geographical location of the city. These images are enclosed in a double ring. Surrounding the double ring are • CITY OF LITTLE ROCK •, clockwise around the top and • ARKANSAS •, counterclockwise around the bottom. An oak leaf on either side separates the two legends, beginning below the midpoint of the flag’s height. Another double ring completes the seal design. The lettering and detailing on the images are in black. The flag was selected through a contest sponsored by the city’s board of directors and the City Beautiful Commission. David Wilson, a law clerk, won the $1,000 contest prize. Craig Rains won second place in the contest and a prize of $500, David Tullis won third place and $250. "City employees Leland Couch (left) and Ron Ross hoist the Little Rock flag over La Petite Roche during a dedication ceremony Wednesday for the city's namesake. City parks and recreation workers have improved the area surrounding the local landmark over the past year to increase its prominence. ( Lewis Delavan photo)"